Shanley Pump and Equipment carries a full line of the most popular sizes and styles in Centrifugal Pump Seals and Progressive Cavity Pump Seals ready to ship in stock the same day you order. We carry mechanical pump seals and standard single-spring pump seals as well as cartridge pump seals for you centrifugal pumps and progressive cavity pumps. We carry Allweiler pump seals, EDUR pump seals, Speck Pump Seals, Hilge pump seals, OSNA pump seals, Seim pump seals and more in both standard cartridge design and mechanical seals for both single and double set installations. Pump seals are available as either OEM or replacement from some of the best names in pump sealing today like John Crane, Smith and Loveless and more and are designed to work under the most adverse of conditions. Our Pump Seals use the very best in Ceramics, Carbon, Tungsten Carbides and other exotic materials for a quality fit and operation in-between servicing and maintenance. We also carry Progressive Cavity Pump Seals for our entire Liberty Process Equipment line of progressive cavity pumps that work with Moyno®, and Tarby®. Contact a Shanley Pump and Equipment, Inc. representative today for more information about our Replacement OEM and Aftermarket Centrifugal and Progressive Cavity Pump Seals. If you are looking to purchase any of the seals we carry, or are having difficulty finding the seal you need for your existing pump, please contact us with your pump model and serial number. We'll be glad to assist you! HILGE single and multi-stage sanitary centrifugal pumps in 316 rolled stainless steel provide exceptional solutions in a variety of sanitary pumping fields such as brewery and microbrewery applications. 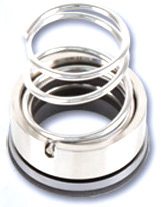 We carry a full line of replacement seals for our Portable Brewery Pumps. Osna non-self priming pumps are ideal for the pumping of clear and slightly contaminated liquids such as Fresh water, drinking water, boiler feed water, process water, sea and brackish water, hot water, condensate, lye's etc. Speck Centrifugal Thermal Heat Transfer Pumps are designed for the transport and re circulation of organic heat transfer oils such as heated mineral oils and/or oils of a synthetic basis as well as hot water heat transfer applications throughout the world. Shanley Pump and Equipment carries Allweiler Replacement Pump Seals for both centrifugal and progressive cavity pumps.